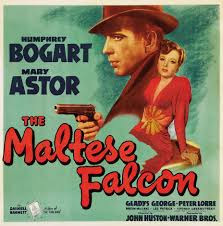 John Timpane, my editor at the Philadelphia Inquirer, reports on John Huston's classic crime film The Maltese Falcon appearing once again on the big screen. It's the best movie ever made about a paperweight that just sits there and does nothing. The Maltese Falcon turns 75 this year. This 1941 Warner Bros. film was (amazingly) John Huston's first directing turn; he wrote the script, too, largely from the hard-boiled dialogue in Dashiell Hammett's 1929 smash-hit novel. Now you can see it on the big screen - and you really should. The Maltese Falcon will fly Sunday and Wednesday on more than 650 big-screen theaters across the land. Local venues include the UA Riverside Plaza, the University 6, the Ritz 16 in Voorhees, Movies 16 in Somerdale, the King of Prussia 16, the Neshaminy 24. For theaters, times, and ticket prices, visit here. It's part of the year-long Fathom Events and Turner Classic Movies Big Screen Classics series. They've already done Butch Cassidy and the Sundance Kid, and next month, from on high, The Ten Commandments.